Stylists and salon owners alike know the struggles of hair clogs. Cleaning out those clogs can be messy, expensive, and lead to expensive plumbing repairs. Drake Mechanical can build custom hair traps to keep you salon, and your plumbing running smoothly. These stainless steel strainers can withstand the chemicals being rinsed down the sink, are easy to remove and allow you to clean out the hair without having to touch it! 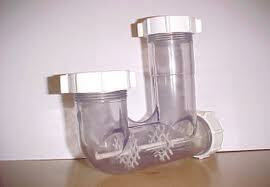 We fit the traps to your existing plumbing and fit the cap with a gasket- no more leaks in your cabinets! We also have the tools necessary to break down hair in the line, keeping your salon running at peak efficiency for years to come! Whether you are builnig from the ground up or retrofitting an existing building, we can assist with your air flow needs! Salons, especially nail salons, have specific ventilation needs. Our Right-Size experts can walk you through the options that best suit your salon and budget. and a few other hair traps that we can get for you.